Today we give you a crash course on grips. 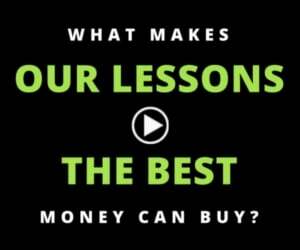 This video is for all skill levels. – [Scott] Hey guys. 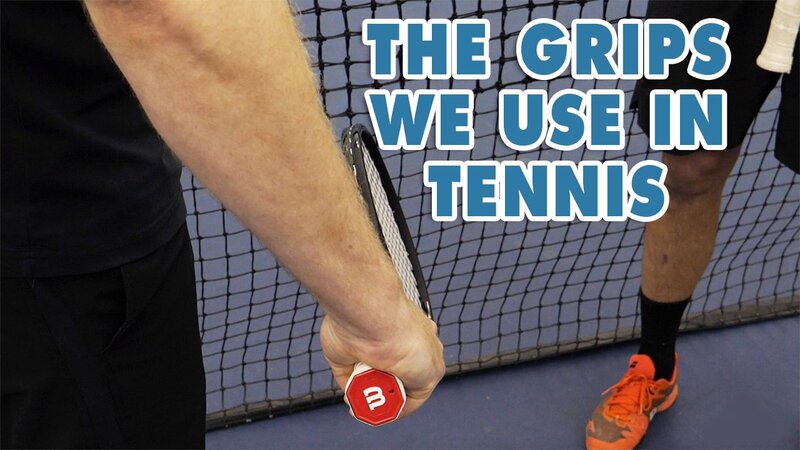 Scott and Nate from PlayYourCourt.com and today we’re going to show you all of the different grips that you use when you’re playing tennis. Alright guys, so today we’re talking about grips. I know a lot of you, even higher level players, play a bunch of tennis and you hear these different grips and just might not know what they are. So today, we’re really gonna dive in, zoom in on my hand, and show you exactly what all these different grips are and what they’re used for. Alright guys, so the first grip that we’re gonna cover today is the continental grip. This is an extremely important grip because if you’re doing this correctly, this really is a grip you should be using on your serve, your overheads, your volleys, and the bottom hand of your two-handed backhand. So, a lot of use out of this grip, really important that you get it right. So as you zoom in on my hand here, what you’ll see is the racket has eight bevels. So if I turn the racket around, you’ll see here there’s eight sides to the racket. We’re gonna talk about starting from bevel one, which is the bevel on top, and moving one spot clockwise with the base knuckle on my index finger. That’s how we’re gonna find this continental grip. So if you look, when I grab the racket and you look at this knuckle that I make when I make a fist on my index hand. When I place that knuckle on the second bevel, again one, two, on the second bevel, this is a continental grip. One thing that I think a lot of coaches miss that I also like to cover, is the heel of your hand should also be on this bevel. So when I turn my hand around, what you’re gonna notice is that the heel of my hand is also on the same bevel of the racket. Alright Nate, you with me? The continental grip, makes sense? – [Nate] I was really having a hard time not focusing on that massive sodium rich hand. You did have a continental breakfast this morning. – [Scott] Super, super, super hurtful. So, my fat, chubby hands aside, a reminder the continental grip is really important if you’re trying to generate power on your serve, it allows that wrist snap. It allows you, when you’re at the net, to not have to change grips frantically. You can use this continental grip to hit both a forehand and backhand volley without changing. And on the overhead, same concept is in the serve. You can get that same snap power with the continental grip, that you can’t from others. So, this is a huge grip. This really is, I would say, kinda the fundamental grip for tennis that you really need to learn. I think it’s tricky for a lot of beginners first when they’re serving and volleying to sorta figure this out. But keep practicing it, it is important. – [Nate] A lot of you guys out there with that frying pan grip, and this is the key. The continental with the volley, especially raising the ceiling for the serve, the continental grip is absolutely a must-have tool. – [Scott] For sure, so let’s move one bevel over. We’re gonna zoom back in on my hand now. So, we just talked about the continental grip which is where I’m still located right now. As I turn, again, and remember we’re using the base knuckle of my index finger for a guide here. As we turn one bevel further, what you’ll see here is an eastern forehand grip. So this is a little bit more of an old school grip. To be completely honest with you, this is what I still use. I get made fun of a lot for, but there are some good players that are very close to an eastern forehand. In between eastern and semi-western, a Del Potro, a Federer, still use a little bit more of an old school grip. So while most coaches are gonna teach you semi-western forehand, which is what we’ll cover next, this is an acceptable grip, especially if you’re looking to hit a slightly flatter forehand. So again, continental on bevel two. When we shift both our knuckle, and again, the heel of our hand around to bevel three, we’ve got an eastern forehand grip. So moving on to our next grip, the semi-western forehand, and again just to do kind of a quick recap here, we started with continental on bevel two. Remember our base knuckle and heel of our hand is on bevel two. Our eastern forehand grip, our base knuckle and heel of our hand is on bevel three. Now when we turn the racket over like a frying pan and work our way to bevel four, we have with a large majority of coaches including Nate and I, would recommend that you use to generate a topspin forehand, this grip is called a semi-western forehand grip. Again you’ll see, my base knuckle is on bevel four, and the heel of my hand, when I turn around, is also on the same bevel. – [Nate] Alright guys, so the semi-western is one of the most critical tools we can have for implementing power and spin on our forehand. There’s still eastern grips out there, Scott still plays with an eastern grip. And although he can hit a big ball, he’s not gonna generate the same RPMs, not even close to like, my RPMs with my semi-western grip. – [Scott] He’s got nice RPMs. – [Nate] A lot of RPMs, alright, and that’s rotations right, we’re talking about how many times the ball’s rotating around. And with the semi-western, it used to be that you’d learn a continental, then and eastern, and then get switched over. And we’d say most of the student we work with today, we start them immediately with a semi-western. I always think of it, it’s like, here’s the keys to the Lamborghini. You’re gonna wreck it, it’s gonna be a little bit tricky, but the ceiling’s so high on it, right? A lot of times starting with these continental forehands, the eastern to some degree, the ceiling’s relatively low, and we end up changing to a semi-western later on. So that’s really the preferred grip. I’d say like 99% of the tour on the men and women side both plays with the semi-western. Federer’s arguably an eastern, but it’s still probably a little bit of a semi-western as well. But, this is the grip that’s preferred and we think you should get out there with it as soon as you can. – [Scott] Yeah guys, I have to agree with Nate here. Even though I still hit with an eastern grip, I actually coach semi-western and I think, honestly, If I had learned a semi-western and really focused on this at a younger age my game might’ve actually gone further. I know, when I got to college, it was difficult for me using an eastern forehand, and generate the type of spin that would push the players off the court. So while eastern was okay, as a big fish in a small pond, when I got out there with better players, it definitely held me back. So even today, I coach the semi-western forehand, even though I myself still use an eastern. So we’ll go ahead now and move on to the next grip. So, the last grip we’re gonna cover today is called the full western. If you take your semi-western, again, which is right here on the, one, two, three, fourth bevel, that’s what you’ve got with semi-western. If you go one bevel further, to the fifth bevel, where you’re holding it actually, if you see, you’re completely on the side of the racket. So the heel of my hand and my index knuckle are actually on the side of the racket. This is what we call full western. And Nate, I don’t know about you, but I definitely don’t recommend full western here. Thoughts? – [Nate] Yeah, it’s one of those things in the 90s that got really popular, specifically with the Spanish clay court, or Sergi Bruguera, who was a great player. He played with more of a western grip. It just has too many weaknesses. It’s good on high balls, really difficult on low balls. Fast courts, it just doesn’t really work the same. I mean, it is virtually extinct at this point, much like the cow you consumed for breakfast this morning. – [Nate] I’m sorry. Was it egg, with bacon and sausage? – [Nate] Or just sausage? – [Scott] Bullying in 2018, I thought we were over this. Alright so, all fat jokes aside, what we’re looking for on the forehand is definitely the semi-western. What we’re looking for on the bottom hand of your backhand, your volley grips, your overhead and your serves, is definitely the continental. We really only covered the forehand side today, but these are the fundamental grips. Continental and semi-western I would say, are the two you really need to know and master to make sure you’re hitting big forehands with lots of topspin, and to make sure you’re getting the snap and power that you need on your serve and overhead as well as the control that you need to quickly hit both forehand and backhand volleys up at the net. 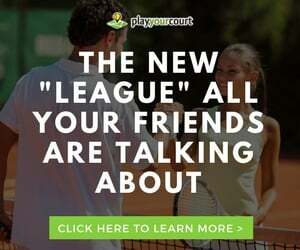 And guys, at PlayYourCourt, remember, Nate and I, we just wanna help you improve your game and as much as we know about coaching, we don’t know much about your specific tennis game. And this advice, maybe not grips so much, but some of the other coaching we deliver varies a ton based on your skill level, so do us a favor. Click the button or the link below, answer a couple of quick questions for us about your tennis game, and we’ll send you some custom video coaching based on the specific things that you should be working on. Just click below, and we’ll do the rest.